Today is the International Day for the Elimination of Violence Against Women. 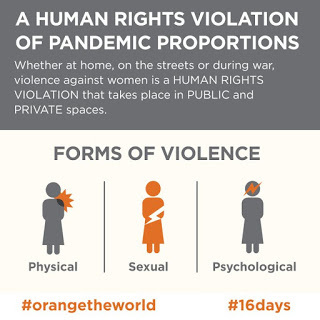 From November 25th through December 10th (Human Rights Day) the UN proposes the 16 Days of Activism against Gender-Based Violence. Violence against women is a human rights violation, a consequence of the persisting inequalities between men and women in law and practice, and it has been identified as a global pandemic. “Violence against women and girls is a human rights violation… The world cannot afford to pay this price.” Ban Ki-moon, UN Secretary General.